We are approaching a busy holiday period this week throughout the corridor with Canada Day and Independence Day. Millions of people will take to the highways, travelling to celebrations with family and friends. In 2014, over the 4th of July holiday (6 p.m. July 3rd to 5:59 a.m. July 7th), 164 people were killed in crashes involving at least one driver or motorcycle operator with a blood alcohol concentration (BAC) of .08 or higher. Those preventable deaths make up 41% of the 397 people killed in motor vehicle traffic crashes over the 4th of July period. It is always important to drive safely, but please be extra careful as more drivers, and unfortunately more impaired drivers are likely to be on the roads this weekend. Summer is also a busy time for highway construction. It is especially important to be extra careful in construction zones. According to the Federal Highway Administration there were 87,606 crashes in US construction zones in 2010. The Ports-to-Plains Alliance works to secure funding for highway improvements, and we owe it to those construction workers to provide as safe a working environment as possible. They are giving us much needed improvements to our highways in difficult, dangerous settings. Please slow down and observe warning signs when driving through a construction zone. Dear 45: America's Infrastructure Is Falling Apart. It's Time to Rebuild. This open Letter from the U.S. Chamber of Commerce is addressed to the 45th President of the United States. Infrastructure and its impacts on the economy should be a focus of every elected official from the President... to Congress... to state legislators... Are you asking the candidates where infrastructure fits within their priorities? From the Transcontinental Railroads to the Hoover Dam, and from the interstate highway system to our wide deployment of broadband, America has a long and impressive history of providing state-of-the-art infrastructure. However, our nation’s infrastructure, once the envy of the world, is now in decline. Failure to maintain our infrastructure has allowed minor issues to turn into major problems. The latest American Society of Civil Engineers (ASCE) Infrastructure Report Card tells a sad story, saddling America’s infrastructure with D+ grade. Shockingly, this grade is actually an improvement from a grade of D in the previous report. The report estimates that the U.S., at all levels of government, would have to invest $3.6 trillion to bring our country’s infrastructure to a state of good repair by 2020. Study after study has shown that investing in infrastructure leads to better safety, faster economic growth and higher quality of life. Not maintaining our infrastructure will have the reverse effect. So, how can you – the country’s next president – address this important issue? The Sunset Advisory Commission would like your help in reviewing and improving how the state of Texas manages its transportation system through the Texas Department of Transportation (TxDOT). The Legislature has charged our Commission with reviewing TxDOT’s mission and performance. Based on the recommendations of the Sunset Commission, the Texas Legislature ultimately decides whether an agency continues to operate into the future and if so, what changes are needed to improve performance. Your response will be submitted directly to the staff of the Sunset Commission and is completely confidential. Your response will not be released to the agency or the public. To give the staff time to consider your information during our review of TxDOT, we request you complete the survey by Friday, July 15, 2016. If you need more information or have questions about our process, please contact Amy Tripp at (512) 463-1300 or visit our website at www.sunset.texas.gov. We greatly appreciate your assistance and look forward to receiving your feedback. 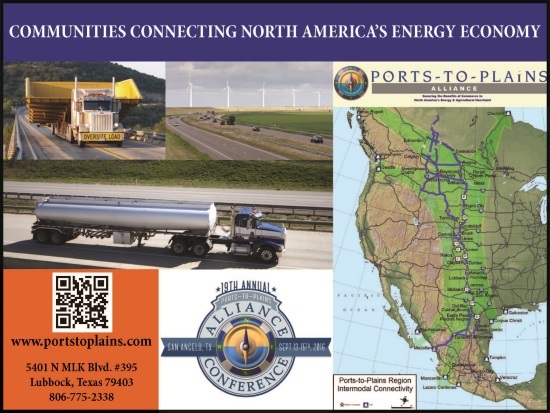 Ports-to-Plains Alliance is pleased to be a partnering organization and Foothills Sponsor for the 28th Annual Rocky Mountain Energy Summit (RMES). We encourage our Alliance members in Colorado to Register to attend. The massive production increases and technological advances of the Shale Revolution have now given way to a period of sharply lower commodity prices, global competition for diminishing markets, and stressful business environments. The challenges are great, but so are the opportunities. As has been the case historically through times of downturn, strategy and technology adapt and evolve to produce the next generation of dynamic growth and success. The 28th Annual Rocky Mountain Energy Summit this August will explore the components of “Our Energy Evolution” as we analyze the current challenges and identify the exciting opportunities ahead for the oil and gas industry. Over three days, we will hear panels and keynotes from an exciting array of industry experts, leaders of companies large and small, and policy makers on subjects of critical importance to understanding what lies ahead. The news continues to worsen for the proponents of Initiative #78, which aims to add mandatory 2,500-foot setbacks from new and existing oil and natural gas operations. Earlier this month, the Colorado Oil and Gas Conservation Commission (COGCC) released a report detailing that the proposed setbacks would ban 90% of Colorado from future energy development. 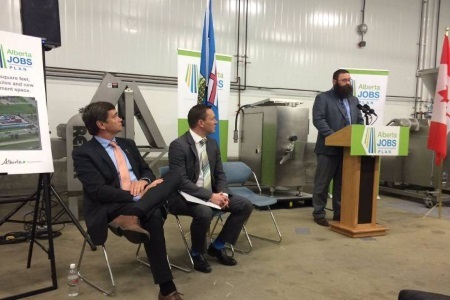 The report drew the ire of business leaders around the state. The setback initiative received another blow this week following a report by the United States Geological Survey (USGS). The report finds that Colorado’s Piceance Basin, thanks to a new assessment of the Mancos Shale formation within the Piceance, may have 40 times more natural gas reserves than previously thought making it the second largest field of recoverable natural gas in the United States. While many, particularly on the jobs-starved West Slope, celebrated the news, it was quickly overshadowed by the looming setback ballot initiative that would ban access to these vast natural gas reserves. Colorado’s Piceance Basin primarily overlays Garfield and Rio Blanco counties. According to the COGCC setback study, these counties will be the most affected by Initiative #78 banning future energy development in 98.9% of Garfield County and 99.2% of Rio Blanco County. While the proposed initiative hasn’t yet qualified for the ballot, paid petition gatherers are collecting signatures in the Denver Metro area to put the constitutional question on the November ballot. “I know when Coloradans across the state learn more about the damaging effects to our urban and rural economies, they’ll loudly voice their opposition and decline to sign these petitions,” Maddalone concluded. For those wanting to register their opposition to the anti-energy ballot measures, please visit NoBackDoorBan.com. Pantex will be getting a new Administrative Support Complex to provide office space for up to 1,100 current employees, which will be a welcome change from aging infrastructure identified as a danger by numerous officials. The building will be 343,000 square feet and will be situated just south of the Pantex Plant. It has been described as a “state-of-the-art” facility that would provide office space for up to several hundred federal and contractor employees. Consolidated Nuclear Security, which manages the Pantex Plant, intends to lease the facility, which will be developed by Lawler-Wood, LLC. Senate lawmakers struggling to reach a deal on how to label food containing genetically modified ingredients said Thursday they are making progress, but acknowledged time is running out before Vermont's first-in-the-nation labeling law takes effect next month. Congress has only six working days before July 1, when Vermont begins requiring that all foods containing genetically modified products be labeled. Any bill approved by the Senate would have to clear the House, which is in recess the last week of June. What is the Value of Colorado Energy? Ports-to-Plains Alliance is a member of Consumer Energy Alliance. While this educational campaign is focused on Colorado, it clearly has application across the Ports-to-Plains Region. Energy is in action everywhere – from illuminating, heating and cooling our homes to producing the clothes that we wear, the medication we take and the food we eat. That's why Consumer Energy Alliance (CEA) recently launched a new educational campaign called “Know the Value” focused on educating Coloradans on the central role that energy plays in their everyday lives, and the industries and activities that rely on energy. As part of this effort, CEA released a series of ads and videos highlighting industries that directly benefit from Colorado energy every day, including agriculture, education, breweries, and medical devices. From the plastics used in manufacturing to life-saving healthcare equipment to durable, waterproof fibers in sportswear to the energy required to power ski resort chairlifts, this effort helps to tell the story of how fossil fuels are very much a part of our daily lives. Colorado Department of Transportation (CDOT) and Iowa Erosion Control have started roadwork improvements along Hwy 287. Work will extend from the south at Milepost (MP) 21.30 in Baca County northward to MP 133 in Cheyenne County, with anticipated completion at the end of the summer. Work primarily involves replacement of deteriorated pavement at various locations throughout the project limits. There will be two locations on the southern end (at MP 56 and MP 57.4) that will require additional work involving the culverts. Minimal work is slated south of Lamar, as well as in four locations within the city limits of Lamar on the westbound lanes of Hwy 50/287. The vast majority of locations are north and south of Eads, including locations within the Eads city limits.